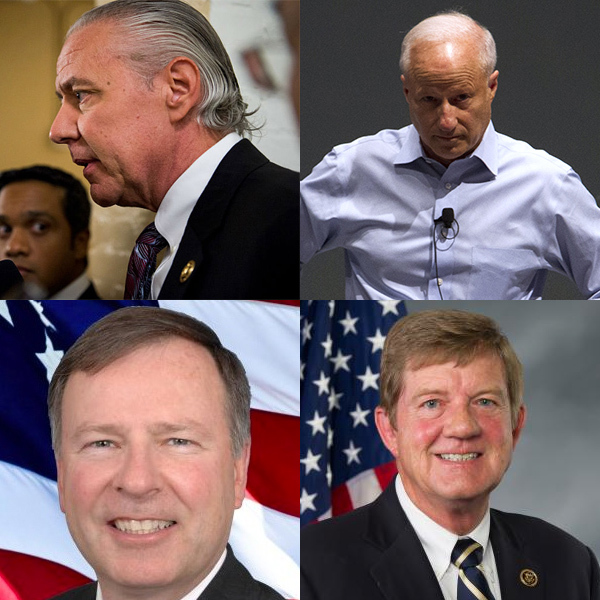 Clockwise from top left: Rep. Ken Buck (R-Greeley), Rep. Mike Coffman (R-Aurora), Rep. Scott Tipton (R-Cortez), and Rep. Doug Lamborn (R-Colo. Springs). Four states held Primary elections on Tuesday (Indiana, North Carolina, Ohio, and West Virginia), and perhaps the biggest takeaway from those results is this: 2018 is a terrible year to be an incumbent Republican. Republican members of the House fared especially poorly Tuesday in primaries across four states, offering fresh evidence that this fall will bring another change election and a new batch of outsiders promising to shake up Washington. North Carolina Rep. Robert Pittenger was felled by former Baptist pastor Mark Harris despite a massive spending advantage, an outcome that caught D.C. Republicans off guard. Harris portrayed the third-term lawmaker as a creature of “the swamp” and relentlessly hammered him over his March vote for the $1.3 trillion spending bill. Pittenger is the first incumbent of either party to be forced out of Congress this year. In the primary to take on Indiana Sen. Joe Donnelly (D), wealthy businessman Mike Braun won an upset over two GOP congressmen, Todd Rokita and Luke Messer, who have been rivals since college and spent months beating the tar out of each other. In West Virginia, Rep. Evan Jenkins (R) lost to state Attorney General Patrick Morrisey in the primary to challenge Sen. Joe Manchin (D). The fifth Republican Member of Congress (from Tuesday alone) who will not be returning to the House in 2019 is Ohio Rep. Jim Renacci, who won the GOP Primary for U.S. Senate in unspectacular fashion; Renacci managed just 47% of the vote against four unknown candidates despite plenty of campaign support from President Trump. There was a time when being a sitting member of Congress was a major advantage when running statewide. You had a political base and a fundraising base. Those days are done — at least for now. Here in Colorado, Rep. Mike Coffman (R-Aurora) is regularly fighting for his political life, but 2018 may be his toughest challenge yet should Jason Crow emerge from the Democratic Primary (which is likely). Polling results released in February showed Crow with a 5-point lead over Coffman, marking the first time a public poll showed Coffman trailing anyone since he was first elected in CD-6 in 2008. Recent polling also shows Rep. Scott Tipton (R-Cortez) to be in serious trouble this fall, thanks in large part to his support for the Great Republican Tax Cut for Rich People and his regular enthusiasm for gutting health care benefits. In CD-5, Rep. Doug Lamborn (R-Colorado Springs) almost failed to make the June Primary ballot altogether, though he’ll still have a tough fight for his seat against three four Republican challengers. Our final incumbent Republican is Rep. Ken Buck (R-Greeley), who is probably safe because of a combination of relatively-weak Democratic challengers and a sustained effort to build a more “independent” image; still, it’s worth pointing out that Buck seriously considered abandoning his seat in CD-4 last fall in order to run for Attorney General. We’re still six months out from the General Election, but disdain for GOP incumbents partnered with a growing blue wave should make the rest of 2018 very uncomfortable for at least two long-tenured Republican Members of Congress in Colorado. agreed, with Buck close behind him. Tipton and Coffman are in more danger….in that order. There may be a split among opponents to let Lamborn slide through … clearly it would be better to have EITHER Owens or Glenn, not both. But between two opponents who are actually known and have credible political wins (unlike 2016), Owens raising money almost as fast as Lamborn, endorsement for Hill, and the wildcard of independent voters, I'm less certain Lamborn will win. Win the Fourth (WTF) has a battle plan for taking out Buck. Read, "By the Numbers: How Ken Buck Will Lose". It won't be easy, but I'll send the winner of the D primary a check.